Ideal to treat acne, skin aging and damaging, stretch marks, scaring, Psoriasis, and Eczema. Anjou Shea butter is the best companion to improve your skin as well as hair quality on a daily basis. It can be used as an ingredient in a variety of homemade natural products such as soap, body lotions and creams, lip balms, etc. 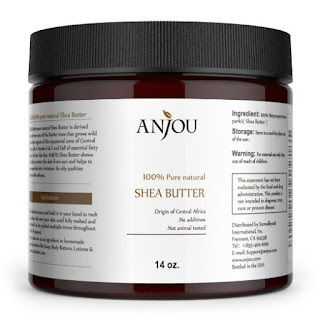 Feel naturally better with Anjou 100% Pure Shea Butter. A whole natural source of wellness with no added additives and not tested on animals. Shea butter produced from Karite tree nuts. The benefits of Vitamin A, Vitamin E, and fatty acids coming from the drier regions of Central Africa. Anjou Shea butter is conscientiously made in the USA. Anjou brings the best source of Africa's Shea butter directly into your neighborhood. Anjou Shea Butter is amazing! I love to make my own homemade lotions and lip balms and let me tell you them come out amazing since I've started using Anjou Shea Butter as an ingredient. The moisture level in my homemade products has increased drastically and my skin and lips feel more hydrated than ever. I also have sensitive skin so I love that Anjou Shea Butter is 100% Pure Shea Butter and contains no additives or chemicals. I also love that it's made in the USA and has so many uses. I highly recommend Anjou Shea Butter!